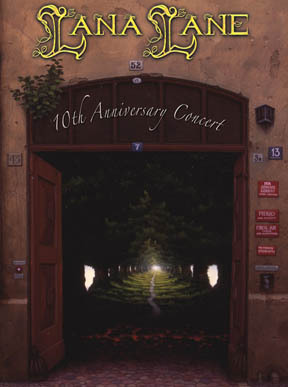 Final concert from the 2005 10th Anniversary Concert recorded in Tokyo Japan presented in its entirety along with bonus 78-min. audio CD. (Los Angeles, 2 December 2005) After 10 years of recording CDs, Lana Lane proudly releases her 10th Anniversary Concert DVD containing the full concert from her final show in Tokyo on the Lana Lane 10th Anniversary Tour. Recorded on June 30, 2005, The 2-hour dual layer "DVD-9" disc contains all 19 songs from the concert along with a Video Tour Diary containing candid "behind-the-scenes" footage of the entire tour from Europe to the USA to Japan. Both stereo and the wonderful sounding DTS 5.1 surround audio tracks are offered. The DVD will be released worldwide in NTSC format in Region 0, to ensure maximum compatibility. The 10th Anniversary Concert package also includes a bonus 78:54 audio CD that contains most of the concert. Due to the space limitations of the CD medium, the songs "Astrology Prelude" and "Secrets of Astrology" were cut from the audio CD. Producer Erik Norlander explains in the booklet's liner notes that he and Lana made this decision since live versions of these two songs already appear on the Return to Japan CD released in 2004. However, for completist collectors, Norlander has made these two songs available for digital download at Mindawn.com. All versions are identical - there are no bonus tracks on any edition. Check out the photo gallery from this concert! Also available while our stock lasts . . .
We are offering Lana Lane 10th Anniversary Tour t-shirts for a very low price as a bundle with the DVD. We have some remaining stock from the tour in select sizes, and we are offering them until supplies are exhausted.